« Microsoft Skype for Business Server 2019 is Finally Here! It is recommended to install on Windows Server 2019 Core to use Microsoft Exchange Server 2019. However, the basic requirement for latest release of Microsoft Exchange is Windows Server 2019, hence providing the right level of security that the system need in todays’ demanding security requirements. Together Windows Server Core and MS Exchange makes the most secure platform for you to work. Further, the latest build of Exchange Server uses only TLS 1.2 out of the box, plus all the legacy ciphers along with hashing algorithms to remove any chance of security compromise. Microsoft Exchange Server is heavily used for calendaring and hence large enterprises are immensely dependent on slandering to proceed with their proceedings. A new feature of calendar is introduced in MS Exchange 2019 that is the restricting the forwarding of a meeting request. It also provides better control over OOF settings. A few such new calendaring features are there for Administrators too like managing events in users’ calendars and assigning delegate permissions with much ease-of-use for Microsoft Exchange Online users. The feature of Unified messaging is deprecated in Microsoft Exchange Server 2019. Customers connecting a third-party PBX or Skype for Business Server with Exchange Server are not able to continue this with Microsoft Exchange Server 2019. As an alternate, Microsoft provides such communication to customers with Skype for Business Server 2019 and using Cloud Voicemail or with Microsoft Office 365 with Cloud Voicemail. Major performance improvements in the latest release of Exchange Server are faster search, using improved Bing technology which provides better results in exchange online, easier administration easier and database failovers have been made much faster. The latest Solid State Drive (SSD) technology is used to add dual storage read/write capabilities in Microsoft Exchange Server 2019. Database caching is improved in order to allocate more memory to active databases and their copies for faster loading. More number of users can be scaled up per user with larger disks and client operations latency reduced to half. With this release, Microsoft Exchange Server can now use 48 processor cores and a total of 256GB of RAM. MachPanel is Microsoft Validated Exchange Control Panel, where you find trusted support for Microsoft Exchange 2019, 2016, 2013, 2010. Trusted globally with on-premise deployments and Automated solutions, MachPanel provides complete automation for standalone, highly available or multi-datacenter Exchange deployment in your environment in a simplified manner. MachPanel offers you fully segregated self-service tools, and the management, selling and billing of fully segregated and multi-tenant hosted exchange. 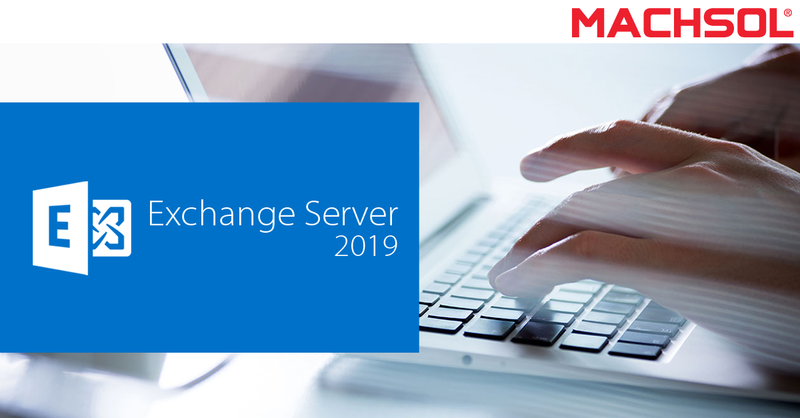 Hence all the Hosters and Partners can avail the features of Microsoft Exchange Server 2019 through MachPanel and stay ahead of others in the market. You can utilize Migration utilities in a better way, as you are able to save time in the process of importing your existing customers to MachPanel. Go ahead and get your hands on MachPanel Automation Module for Microsoft Exchange for a better improved business experience. This entry was posted on Friday, November 9th, 2018 at 1:15 pm	and is filed under Announcements, Microsoft Exchange. You can follow any responses to this entry through the RSS 2.0 feed. Both comments and pings are currently closed.